How do you guys use Spirit Guide oil and products? I've put it on candles on my family altar, and burned the incense smoke on my altar as well. As for the bath crystals, I figure I'll use them once in awhile when I REALLY need some guidance and help from my spirit guides and ancestors, and will then bath in them and clean off the altar with them. And I may use them in the future, as I plan on working out an arrangement so tht a Goetic Spirit can help me with divination, and at some point I'll probably use them in an evocation by putting the oil on the pendulum and asking the Spirit to answer questions via it. Ok guys, that's it, lol. As far as ideas are concerned, I'm taped. Also, how is it different from Guardian Angel oil? Are you talking about the Indian Spirit Guide oil? That only works if you have Native American ancestry. If you have Native American ancestry and do not know it(like me), it can be a great conduit for learning about your Native American blood line. The Guardian Angel oil is just that, it helps you connect with your Guardian Angel. As for your Goeth question, I do not know since this site is about Hoodoo. What ways would you all use the Spirit Guide Oil? I want to guide benevolent spirit guides and ancestors to me and was going to use this oil as a candle dressing. I thought it also may be good to anoint my ancestor altar with it. Any other uses you guys can come up with? And I was considering the Power Oil to help increase my personal spiritual power. Have any of you used this oil? How did it work? Would you use this as a candle dressing and personal anointment oil? Yes, you could use spirit oil like that. I would dress a white candle with it and place it on my ancestor altar. I haven't used Power Oil, so I can't comment on that one. Master Key is similar to what you want though. Have you looked at that one? Thank you for the tips - I haven't looked at Master Key oil but will definitely check it out. Skull candle, blue , white or purple. On the "forehead" of the candle inscribe briefly Your question or word that refers to the situation, or issue with which You would like assistance or guidance. Anoint the candle and ask Spirits for help. Petition Holy Spirit also. Leave the candle burning ( secure ) on Your nightstand and place a glass of water ( simpler form of night water, so nothing disturbs Your dreams while You await for answer ) and go to sleep. You can alternatively anoint Your third e. chakra with Power oil and journal Your dreams. On a piece of blue paper write Your issue You wish guidnace with . Anoint with spirit oil and add to blue mojo with Holly leafs, Althaea root, blue tourmaline and some Solomon pentacle suitable for dreams, visions, answers. Place under pillow and carry with You. Pay attention to the omens appearing before ya . I was wondering what colored candles are typically used when annointed with spirit guide oil?? Re: color candles for spirit guide oil? I would use white candles with Spirit Guide Oil. Ok thank you Devi. works for me i have plenty of white candles. Now for this particular oil, is it one that shouldn't be anointed on the body like some others? I use Spirit Guide on my body sometimes to help enhance the connection to and influence of my spirit guides. Thank you so much Devi. ill use it along with my psychic vision oil as i annoint my 3rd eye area with it. I would say Purple candles would be a more appropriate color to utilize with Spirit Guide Oil when delving into the spirit(s). Remember Purple is the synthesis of Red and Blue. Red has the vibration of fire. Also never forget that fire is transformation - changing one form into another form. VERY useful. Blue has the vibration of water which is a great cleansing and protective element. Also, sometimes forgotten but water is very useful in free-flow, fluidity and has the action of "getting through" obstacles/conditions. White is fine, but Purple would work better, IMHO. White or purple could work with Spirit Guide Oil -- however, in conjure we don't view the colors as elemental attributes. Instead we view them as corresponding to works or principles. For example, among conjure practitioners, purple is the color of mastery, power, and success. These color associations are influenced by popular works like Charmaine Dey's "The Magic Candle," Henri Gamache's "The Master Book of Candle Burning," and Mikhail Strabo's "The Guiding Light to Power and Success." So for spirit work you can use white candles because this color is associated with help and spirituality. Blue is for healing and blue candles would be appropriate for attracting the help of healing spirits. Purple candles would be for spirits mastery and power. If you were calling up dark spirits, you would choose black candles. Made a great grade on my test! Thanks, LM. I am a student in forestry, and this week was very busy for me (midterms week). I had a dendrology test today that I felt a little ill-prepared for, having concentrated a little more on other projects throughout the week. The nature of the dendrology tests is thus: we walk through the woods and identify a series of trees by their binomial latinate names and their common names. Before class, and in a pinch, I dressed a St. Thomas Aquinas prayer card with LM Spirit Guide Oil and asked aloud for St. Thomas to bring unknown or forgotten things to mind and help me get a good grade on my test. I put peach leaves and Master of the Woods (the name alone made me feel good) in my pockets and anointed myself with spirit guide oil and attraction oil, asking for the right answers to be attracted to my conscious mind. I did so well on the test - the right words would just pop into my head. I also felt lead to ask to my teacher, while we were walking, to explain the difference between pin oak and scarlet oak - the next question on the test happened to involve this very difference. THANK YOU, LM! Re: Made a great grade on my test! Thanks, LM. I carried the St. Thomas Aquinas card in my back pocket during the test. I kept touching it between questions and thinking my petition, and also thinking the words "I know I am going to make a 100 on this test." I am also a student and know how stressful exams time can be. Aside fom calling on St. Thomas Aquinas you may also wish to call on St. Joseph of Cupertino for help as he is the patron saint of examinations. Excellent results, thank you for the testimonies. love your story! thanks for sharing. Continued success in your endeavours! Awesome! Glad you did well. Spirit Guide Oil is also used by spirit mediums to draw the spirits of the dead close by. I just wanted to know more about the spirit guide supplies, and how you would go about using the products combined with a doll baby to send somebody spiritual guidance? Do spirits accept whiskey as payment? Yes, the ones who drank alcohol while alive certainly do! I give cigarettes to the ones that had smoked. Cigars to those that loved them. Certain foods that they liked while alive, etc. If you're petitionning the Holy Spirit, I'd stay away from the alcohol and cigarettes and opt for Holy Water and pure beeswax candle instead. I will do that thanks for that, il follow your advice. So i've read that indian spirit guide oil is to be used by people with native american ancestery. I'm of puerto ricAn decent so i do have indian ancestry in my heritage. A lot of people with my ethnic backround, as well as some family memebers have statues offerings and prayers to "el indio" which i've read(and correct me if i'm wrong) is the same or synchronized with black hawk. So would should i use the indian spirit guide oil or just regular spirit guide oil? 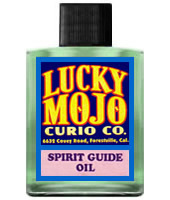 If i were to wear spirit guide oil would i attract benevolent spirits or will my ancestors just follow or both? There's noting wrong with wearing them on yourself but I wouldn't be wearing them all the time. I may wear them when I am in need of help with something and performing a ritual where I am seeking their help. But wearing them all the time? I personally wouldn't do that (although there's nothing wrong with it) because I wouldn't want active Spiritual activity around me all the time. It could really be interfering with your everyday activities. But, both oils are just fine. 1. A very close family member passed away 2 years ago, but not in the same country as I live. Despite the distance, will it be appropriate to dress a white candle with Spirit Guide Oil to speak to him? I light Jewish Soul Candles for him on his memorial day. And of course I speak to him sometimes without lighting candles. But I thought trying something like that would be fulfilling. 2. I have worn the oil on myself once or twice already. I wonder though, and it might not fit - I have the Honey Jar I've been lighting to bring a friend closer for some months now; occasionally it seems to be working amazingly but things have been quite tough lately. I do pray for my Spirit Guides' help whenever I light candles on my Honey Jar, but would using Spirit Guide Oil on it add an extra layer to it? Or maybe on a candle in front of it / by its side while another candle is lit on the Honey Jar? 3. I shouldn't be using it on my Lodestone Mojo Hand I assume (I do have Lodestone Oil I use. And Bourbon, of course)....? 1. Yes you can use this oil in that manner, the distance between where the person physically lived does not matter in the spiritual realm. 2. I have worn the oil myself when also praying to spirit guides to enhance the work, as well as when sleeping mixed with psychic vision oil to invite dreams with the spirit guides. I would not add the oil to the honey jar candle. You can set a candle on the alter with the spirit guide oil, set a glass of water next to it, then do your honey jar. 3. You can mix oils on mojos but this oil does not seem to match the intent of the lodestone mojo. I am not sure what your mojo is for but say its to get a new job, you may add steady work and lodestone oil to the bag together. After fixing the candle on the honey jar, I dressed my hands with Spirit Guide Oil as I prayed to my Spirit Guides for their help. At the beginning, while praying and speaking, I felt some uncertainty about things I was doing (sometimes I'm really confident with the work, and sometimes I'm not), so I repeated sentences and prayers which makes me feel even more iffy! Lately I've had a big dilemma concerning this friend and revealing some things to him, and in a reading I was told to wait at least 4 months before I tell him these things because he's confused and conflicted at the moment. And yet, waiting is so hard that I worried I won't be able to do it. While the candle was burning on the honey jar, my friend made a social media post about Jupiter Retrograde bringing with it a chance for reflection, and that it lasts 4 months. He and I speak about spirituality, but not once did he say a word about Retrogrades or Astrology in the past! I saw that and I realised this is my sign, I must wait and give him a chance to self-reflect before I release my emotions. I took it as the most obvious sign directly from my Guides. Just before the candle burns out, I like to pray to my Spirit Guides one last time and thank them. So I did, I dressed my hands with Spirit Guide Oil again, and spoke to them again. Just as I said my last word, the flame grew for just a second, then burnt out - and the lid popped (no remains left). I know it happens when the lid gets heated up sometimes, but it never happened to me before! It doesn't feel like a coincidence to me. I think it was really powerful today. First time with Spirit Guide Oil... not the last!